The number of melt ponds on Arctic summer sea ice and its reflectance are required for better climate modeling and weather prediction. In order to derive these quantities from optical satellite observations, simple analytical formulas for the bidirectional reflectance factor and albedo at direct and diffuse incidence are derived from basic assumptions and verified with in situ measurements made during the expedition ARK-XXVII/3 of research vessel Polarstern in 2012. This paper assesses the accuracy of high-resolution snow depth maps generated from unmanned aerial vehicle imagery. Snow depth maps are generated from differencing snow-covered and snow-free digital surface models produced from structure from motion techniques. On average, the estimated snow depth error was 10 cm. This technique is therefore useful for observing snow accumulation and melt in deep snow but is restricted to observing peak snow accumulation in shallow snow. The thermal conductivity (TC) of the snow and top soil greatly impacts the permafrost energy budget. We report the first winter-long monitoring of snow and soil TC in the high Arctic. The data and field observations show the formation of a highly insulating basal depth hoar layer overlaid by a more conductive wind slab. 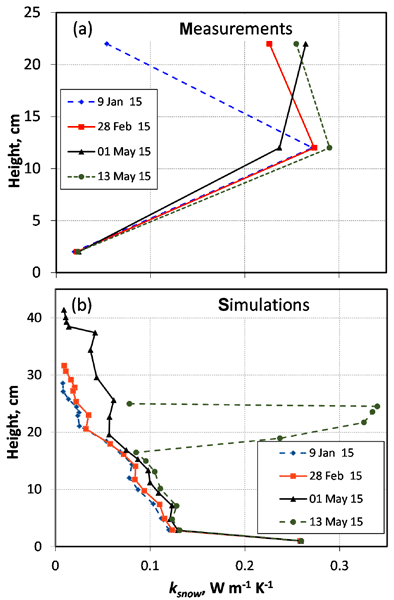 Detailed snow physics models developed for alpine snow cannot reproduce observations because they neglect the strong upward vertical water vapor flux prevailing in Arctic snow. The conventional wisdom is that Arctic warming will result in an increase in the frequency of winter melt events. However, results in this study show little evidence of trends in winter melt frequency over 1988–2013 period. The frequency of winter melt events is strongly influenced by the selection of the start and end dates of winter period, and a fixed-window method for analyzing winter melt events is observed to generate false increasing trends from a shift in the timing of snow cover season. DOC release of Laohugou Glacier No. 12 was 192 kg km−2 yr−1, of which 43.2 % could be decomposed and return to atmosphere as CO2 within 28 days, producing positive feedback in the warming process and influencing downstream ecosystems. Radiative forcing of snow pit DOC was calculated to be 0.43 W m−2, accounting for about 10 % of the radiative forcing caused by BC. Therefore, DOC is also a light-absorbing agent in glacierized regions, influencing the albedo of glacier surface and glacier melting. We demonstrate the short-term unstable retreat of an East Antarctic outlet glacier triggered by imposed sub-ice-shelf melt, compliant with current values, using a state-of-the-art ice-sheet model. We show that pinning points – topographic highs in contact with the ice-shelf base – have a major impact on ice-sheet stability and timing of grounding-line retreat. The study therefore calls for improving our knowledge of sub-ice-shelf bathymetry in order to reduce uncertainties in future ice loss. We combined field data collection with remote sensing data to document the presence and rapid degradation of permafrost in south-central Alaska during 1950–present. Ground temperature measurements confirmed permafrost presence in the region, but remotely sensed images showed that permafrost plateau extent decreased by 60 % since 1950. Better understanding these vulnerable permafrost deposits is important for predicting future permafrost extent across all permafrost regions that are warming. This paper presents a new semi-automated method to calibrate the 1-D soil model COUP. It is the first time (as far as we know) that this approach is developed for mountain permafrost. It is applied at six test sites in the Swiss Alps. In a second step, the calibrated model is used for RCM-based simulations with specific downscaling of RCM data to the borehole scale. We show projections of the permafrost evolution at the six sites until the end of the century and according to the A1B scenario. Contrary to expectations, Antarctic sea ice cover has been increasing in area during the last three decades. In order to put these trends into a wider context this paper analyses direct observations of sea ice, recorded in ships' logbooks during the Heroic Age of Antarctic Exploration (1887–1917) for the first time. It shows that the sea ice was significantly further north in the Weddell Sea during the period but comparable to the present day in other sectors. The study presents a dual domain approach to simulate liquid water flow in snow using the 1-D physics based snow cover model SNOWPACK. In this approach, the pore space is separated into a part for matrix flow and a part that represents preferential flow. Using this approach, water can percolate sub-freezing snow and form dense (ice) layers. A comparison with snow pits shows that some of the observed ice layers were reproduced by the model while others remain challenging to simulate. As a potentially operational daily product, the SMOS-Ice can improve the statements of sea ice thickness and concentration. In this study, focusing on the SMOS-Ice data assimilated into the TOPAZ system, the quantitative evaluation for the impacts and the concerned comparison with the present observation system are valuable to understand the further improvement of the accuracy of operational ocean forecasting system. New ice cores were extracted from Alto dell'Ortles, the highest glacier of South Tyrol in the Italian Alps, to check whether prehistoric ice, which is coeval to the famous 5300-yr-old Tyrolean Iceman, is still preserved in this region. Dating of the ice cores confirms the hypothesis and indicates the drilling site has been glaciated since the end of the Northern Hemisphere Climatic Optimum (7000 yrs BP). We also infer that an unprecedented acceleration of the glacier flow has recently begun. Atmospheric–glacier surface interactions govern melt, where each variable has a different impact depending on the region and time of year. To understand these impacts and their year-to-year variability on summer melt extent, we examine melt sensitivity to different meteorological variables at a glacier in the Canadian Rockies. Cloud conditions, surface albedo, temperature, and humidity are all important to melt extent and should be considered in models of glacier response to climate change. The physical properties of ice are of interest in the study of the dynamics of sea ice, glaciers, and ice sheets. We used resonant ultrasound spectroscopy to estimate the effects of temperature on the elastic and anelastic characteristics of polycrystalline ice, which control the propagation of sound waves. This information helps calibrate seismic data, in order to determine regional-scale ice properties, improving our ability to predict ice sheet behaviour in response to climate change. We measured the snowfall densities with a CCD camera, simultaneously observing the predominant snowfall types determined by the measured size and the fall speed. With a CCD camera, we obtain the quantitative relationships between snowfall densities and presumed density derived from the size and mass components. This suggests the possibility of estimating snowfall densities from the measured size and the fall speed data, and using them as the initial densities for a snowpack in a numerical model. Optical and microwave modelling of snow involve different metrics of "grain size" and existing, empirical relations between them are subject to considerable scatter. We introduce two objectively defined metrics of grain shape, derived from micro-computed tomography images, that lead to improved statistical models between the different grain metrics. Our results allow to assess the relevance of grain shape in both fields on common grounds. Rock glaciers are landforms indicative of permafrost creep and received considerable attention concerning their dynamical and thermal changes. We use a holistic approach to analyze and model the current and long-term dynamical development of two rock glaciers in the Swiss Alps. The modeling results show the impact of variations in temperature and sediment–ice supply on rock glacier evolution and describe proceeding signs of degradation due to climate warming. The paper deals with the micrometeorological conditions on mountain glaciers. We use idealized large-eddy simulations to study the heat transport associated with the local wind systems and its impact on the energy exchange between atmosphere and glaciers. Our results demonstrate how the sensible heat flux variablility on glaciers is related to topographic effects and that the energy surplus is strong enough to significantly increase the local glacier melting rates. The Rupelian Clay in the Netherlands is currently the subject of a feasibility study with respect to the storage of radioactive waste in the Netherlands (OPERA-project). Many features need to be considered in the assessment of the long-term evolution of the natural environment surrounding a geological waste disposal facility. One of these is permafrost development since it may have an impact on various components of the disposal system. Non-destructive in situ monitoring of sea-ice microstructure is of value to sea-ice research and operations but remains elusive to date. We relate in situ measurements of sea-ice dielectric properties at frequencies of 10 to 95 Hz to ice temperature, salinity, and microstructure. Results support the possible use of low-frequency electric measurements to monitor the seasonal evolution of brine volume fraction, pore volume, and connectivity of pore space in sea ice. In the Alps, glacier cover, snow farming and technical snow production were introduced as adaptation measures to climate change one decade ago. Comparing elevation changes in areas with and without mass balance management in five ski resorts showed that locally up to 20 m of ice thickness was preserved compared to non-maintained areas. The method can be applied to maintainance of skiing infrastructure but has also some potential for melt management at high and dry glaciers. In this study we present a new processing methodology for retrieving surface elevations and elevation changes over glaciated terrain from CryoSat-2 data. The new methodology has been shown to be less sensitive to changes in near-surface dielectric properties and provides improved elevation and elevation change retrievals. This methodology has been applied to the Greenland Ice Sheet to provide an updated volume change estimate for the period of 2011 to 2015. Kamb Ice Stream (KIS) in Antarctica ceased rapid ice flow approximately 160 years ago, still influencing on the current mass balance of the West Antarctic Ice Sheet. We identify two previously unknown subglacial lakes beneath the stagnated trunk of the KIS. Rapid fill-drain hydrologic events over several months indicate that the lakes are probably connected by a subglacial drainage network. Our findings support previously published conceptual models of the KIS shutdown. We present 7 years of field work and modelling to assess the importance of the loss of water from the snow by means of evaposublimation in the Mediterranean mountains of Sierra Nevada. The actual evaposublimation rates were detected through detailed measurement of the mass fluxes from the snow. These data have led to some improvements in the modelling of the snow dynamics in this kind of mountainous semiarid regions. Evaposublimation is estimated to range 24–33% of total annual snowfall. 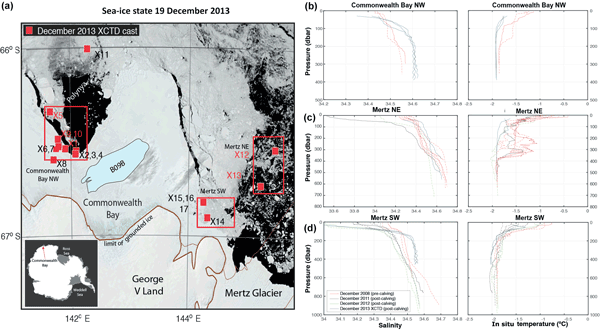 We present spatial and temporal characteristics of 17 Arctic polynya regions. By using an energy balance model, daily thin-ice thickness distributions are derived from TIR satellite and atmospheric reanalysis data. All polynyas combined yield an average ice production of about 1811 km3 per winter. Interestingly, we find distinct regional differences in calculated trends over the last 13 years. Finally, we set a special focus on the Laptev Sea region and its relation to the Transpolar Drift. The first implementation of particle tracking velocimetry in outdoor alpine blowing snow has both provided new insight on intermittent snow particle transport initiation and entrainment in the dense near-surface "creep" layer whilst also confirming some wind tunnel observations. Environmental PTV has shown to be a viable avenue for furthering our understanding of the coupling of the atmospheric boundary layer turbulence and blowing snow transport. Crystallographic texture evolution with depth along ice cores can be evaluated using borehole sonic logging measurements. These measurements provide the velocities of elastic waves that depend on the ice polycrystal anisotropy and can further be related to the ice texture. To do so, elastic velocities need to be inverted from a modeling approach that relate elastic velocities to ice texture. The present paper presents a critical analysis of the different methods used for the inversion. A meaningful interpretation of the climatic history contained in ice cores requires a precise chronology. For dating the older and deeper part of the glaciers, radiocarbon analysis can be used when organic matter such as plant or insect fragments are found in the ice. Since this happens rarely, a complementary dating tool, based on radiocarbon dating of the insoluble fraction of carbonaceous aerosols entrapped in the ice, allows for ice dating between 200 and more than 10 000 years.